Kristin was able to find her cow, but we still have a mailing list of people looking for Belle. I am looking for a 12 inch cream and black Gund Belle Cow (60012), made before 2002. It is made of very soft, terry like material with a smooshy body. 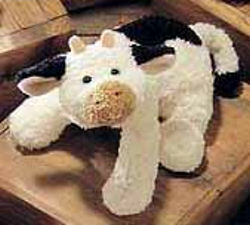 I can find a Gund Milkshake Cow, which is quite similar, but not the same. The one I’m looking for is more of a terry cloth, rather than plush. When my son was only 2 weeks old, he received the cow from a friend. From the time he was 8 months old, he has been completely attached to his ”Moo Cow.” He is now 8 years old! He has been in tears recently because he is so afraid his special cow is going to fall apart. I have looked everywhere online, as this is discontinued. I saw there had been one on eBay a while ago, but not anymore. Any help would be much appreciated. I am looking for this cow too!!! My son had it when he was little (now 18) and I have a 1 1/2 year old little girl that takes Belle EVERYWHERE! I am very afraid that Belle will not last another long term love afair! She is looking a little too well loved and I desperetly need another, younger Belle to take up Babysitting duties. Please let me know if there is a Belle that needs a loving home. I am looking for the same cow! my son got his when he was 3 months old and slept every night as well with his “moo”. I bought him a replacement “milkshake” cow but it’s just not the same. if anyone has information on where to buy one i would love to know about it! The one on e-crater is $74.95 plus $3.95 shipping and handling. I wish people weren’t so caught up in making so much money. I would gladly pay more than the orignal amount, but this is absurd! I’ve gotten so excited to hear that Belle cow was available, only to be disappointed that it cost so much. 🙁 I will continue the search, though. Thanks for the help. Thank you all so much for your help, but I finally found one on eBay! Since I know many others are looking still, I will continue to keep my eyes open and will let you know if I see another one. Thanks again!